Cryotherapy may be defined as the treatment of pain by use of freezing temperature. This extremely cold temperature is used to dampen a nerve that is irritated by the pain. The therapy may also be used to treat certain cancers. In addition to this, cryotherapy is also used by dermatologists during the treatment of abnormal skin cells. During this process, a kind of probe is inserted into the tissue that is adjacent to the nerve that is affected by the extreme pain. The probe that is inserted, then automatically lowers its temperature to freezing mode. As a result, the affected nerve becomes inactive. In turn, this ensures that the irritation, as well as the pain of the nerve, are relieved. Cryotherapy may also be carried out in a sauna-like chamber known as the cryotherapy unit, cryosauna or cryotherapy chamber. This is also referred to as whole-body cryotherapy. However, these chambers use nitrogen in liquid form to carry out the process. The liquid nitrogen is found in the chamber and their temperatures are lowered to as low as -160 degrees. The whole cryotherapy session should be carried out by an experienced, certified and trained cryotherapy technician. If the process is carried out in a chamber, then the participant wear gloves, slippers, and socks or even briefs. However, you are strongly advised not to apply any moisture promoting the product to your skin an hour before the procedure. Additionally, you should not have any jewellery, makeup or metal wear. During the first step toxins and other harmful substances are expected to be extracted from your blood. That is during the initial stage, which takes place between two to three minutes. During this process, the extreme cold and freezing temperatures are expected to work with your body’s physiology to produce the desired detox and numbing effect. During the second step, the body’s physiology now tries to normalize itself. However, it does this with cleansed blood, which is filled with nutrients, oxygen, and other vital organisms. This rich blood comes courtesy of cryotherapy. In this stage, your body also warms itself up. However, for your body to fully recover, it will need a time frame of approximately 48 hours. That is the last step, which can also be called the restoration step. That is because, throughout this period, your body completely restores itself to how it was before albeit in a healthier manner. Moreover, the process will also promote more energy levels in your body. Cryotherapy is known to treat conditions such as osteoarthritis, extreme back pain, fibromyalgia, muscle trains, rheumatoid arthritis, as well as tendinitis. Renowned sports personalities have used this therapy to relieve their bodies from extreme pain and fatigue which sporting activities bring. 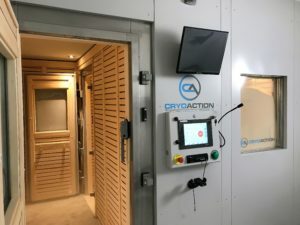 If you have a condition that you want to treat using cryotherapy, ensure you discuss it with the person administering or assisting with your treatment. It is always recommended consulting a doctor before you use any type of therapy.